The Madison College volleyball team celebrates a win over Edgewood JV on Oct. 23. After a dominant win over Milwaukee Area Technical College on Oct. 16, the Madison College women’s volleyball team gathered for a team picture. Everyone smiled and raised three fingers in the air, celebrating the fact that they just won their third-straight North Central Community College Conference title. 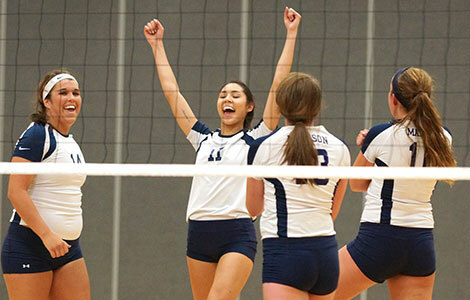 Madison College finished the conference season with just one loss and claimed sole possession of the conference crown with its 25-12, 25-11, 25-18 victory against Milwaukee Area Technical College. That’s one title defended, another bigger one to go for the defending national champs. Madison College boasts a 23-3 overall record and is now ranked No. 2 in the NJCAA Division III behind Rochester Community and Technical College. After matches on Oct. 27 against the Carthage College and UW-Whitewater Junior Varsity teams, the WolfPack will turn their attention to post-season play. The first match of the NJCAA Region IV Tournament quarterfinals will be held on Oct. 30, and Madison College appears to be ready to roll after a pair of recent dominant victories. The WolfPack was able to dominate in Milwaukee on Oct. 16, when it swept the Stormers, 3-0. Freshmen led the way offensively, with Abbey Loken posting 12 kills and Allie Lehner added eight more. Brianne Brueggens posted 19 assists. Sophomore Sydney Clarson led the defensive effort with 15 digs in the match. Second-year players led the way to a 3-0 victory against Edgewood College’s JV on Oct. 23, a fitting way to celebrate the team’s “senior” night. Led by 10 kills from sophomore middle blocker Mikayla Nigl, the WolfPack posted an easy 25-14, 25-18, 25-17 victory. Sophomore setter Hannah Grahn finished with 19 assists, while Clarson added 12 digs. The winner of the NJCAA Division IV quarterfinals will advance to the regional tournament that will be held in Joliet, Ill, on Nov. 1. The national tournament will be held Nov. 13-15.